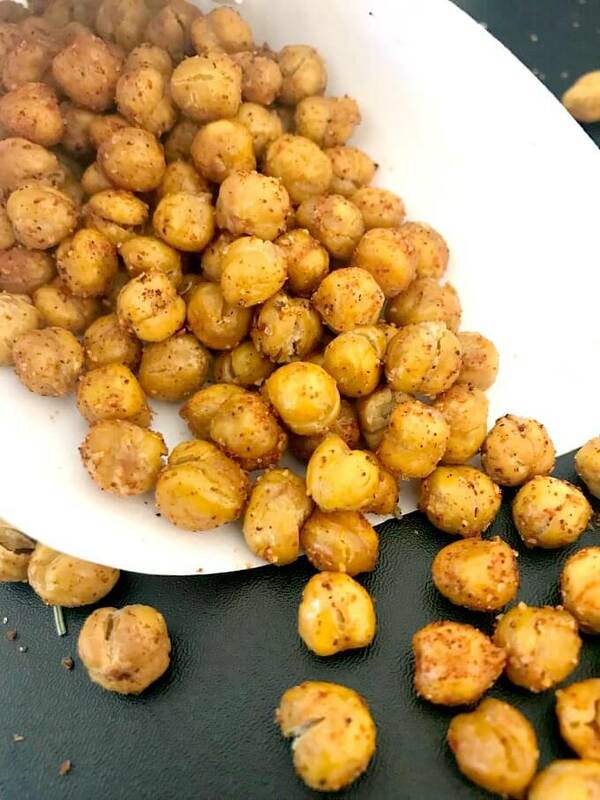 Spicy & Crunchy Roasted Chickpeas, with a hint of rosemary, a healthy and delicious snack that goes down a treat. Low carb and high protein, this is a fabulous vegan snack if you want to keep you calorie intake low. So you’ve decided to bin those crisps and sugary nibbles that keep staring at you and calling your name. From today you are going to be brave and go back to a healthy lifestyle. Easier said than done, l know. But what’s the alternative to all that naughtiness you’ve been having? How about some roasted chickpeas? 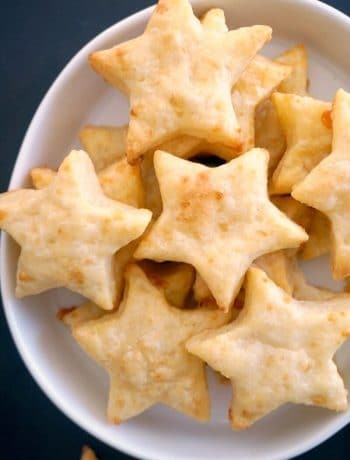 They are tons healthier and the excellent snack if you like some good crunch. Chickpeas are high in protein and fibre and low in fat, which makes them an excellent choice when it comes about eating healthily. 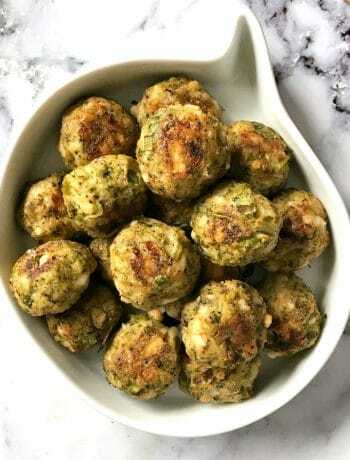 Although most people associate chickpeas with hummus and falafel, they are great in any salad or stews. I love chickpeas and I often open a can and just eat them like that. 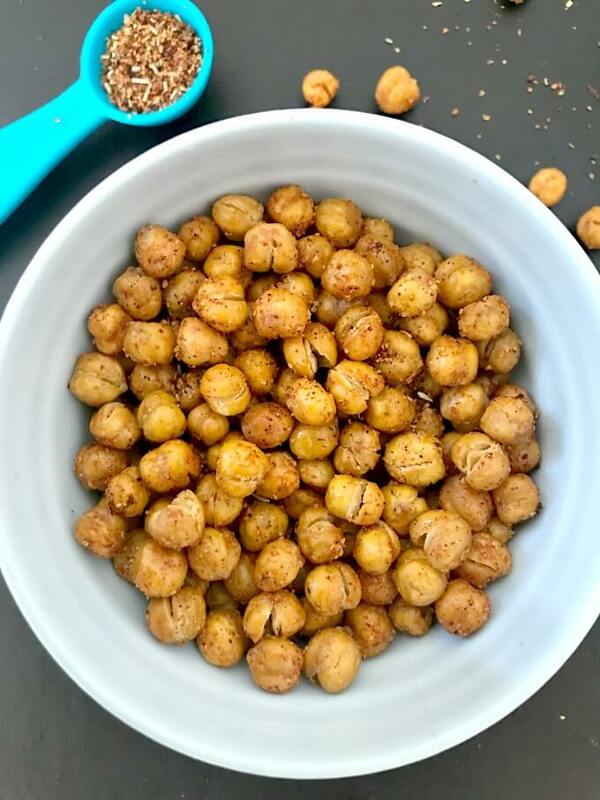 To make these crunchy roasted chickpeas with a chilli kick I used smoked paprika, rosemary, galic powder and cayenne pepper, but you can replace these with any other spices. Or just salt, if you are not very keen on spicy snacks. Also, it makes things a lot easier to buy canned chickpeas, since they are already cooked and so cheap, but you can also buy dried chickpeas and cook them yourself. So, how to get that crunch we love? Firsty, make sure you drain and pat dry the chickepeas well. Moist chickepeas won’t get as crunchy as you like, no matter how long they stay in the oven. Also, it helps a lot if you peel the chickpeas. I know, a boring task, if you ask me, but you will see the difference, and it will pay off in the end. This is also the case if you want a smooth Spicy Hummus Recipe With Tahini or some delicious chickpea patties. 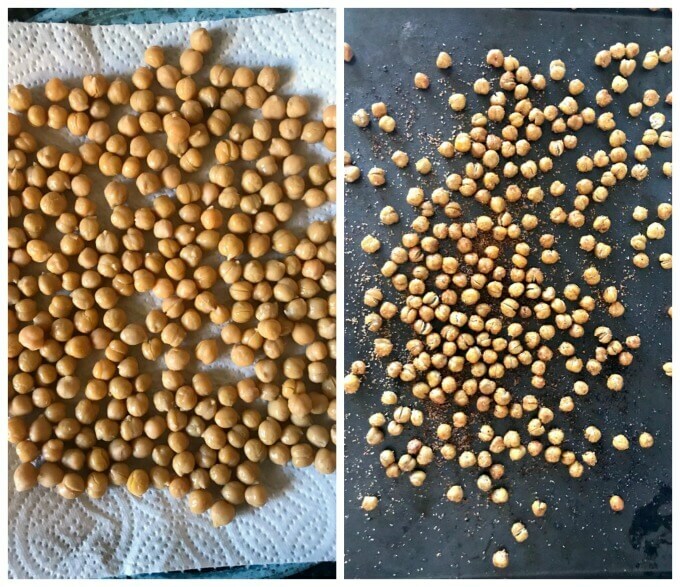 Leave the chickpeas to dry for at least one hour, the longer, the better. I like to mix them only with oil at first and roast them, and add the spices once they are out of the oven. In this way, they roast beautifully, and the spices taste a lot better. And what yo get is the most delicious snack, and the best you can get if you want to stay away from highly processed snack. Just be careful if you have kids around, as they can choke on the crunchy chickpeas. I’m always careful not to have the little ones around if I snack on them, you never know when a curious toddler decides to have a mouthful. 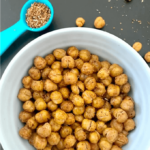 If you’ve tried thiese SPICY AND CRUNCHY ROASTED CHICKPEAS or any other recipe on the blog then don’t forget to rate the recipe and let me know how you got on in the comments below, I love hearing from you! You can also FOLLOW ME on FACEBOOK, and PINTEREST to see more delicious food and what I’m getting up to. Spicy & Crunchy Roasted Chickpeas, with a hint of rosemary, a healthy and delicious snack that goes down a treat. Low carb and high protein, this is a fabulous snack if you want to keep you calorie intake low. Drain and wash the chickpeas, then pat dry with kitchen towels. Leave to dry for at least one hour. Pre-heat the oven to 200 degrees Celsius (400 Fahrenheit). Toss the chickpeas with the olive oil, spread them on a baking tray, and roast for 45 minutes or until crunchy. Mix all the spices together, then remove the chickpeas from the oven, toss the spices in, give them a good shake and leave to cool. Plenty of good reasons for eating chickpeas instead of more salty or sugary snacks.